The clothes I tried were generous in their sizing and were very comfortable. The staff were welcoming, amd helped me as I am disabled and have an assistance dog. 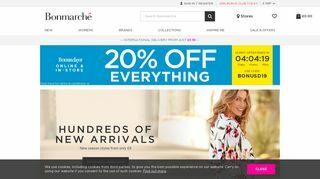 I sometimes buy clothes from Bonmarche, even though I am not the usual demographic! It does have a reputation for being for the older lady, as the clothing could be considered as old-fashioned, however TV’s Mark Heyes now designs for them, and I recently bought a skirt for work which is very on-trend and flattering. Please do more modern clothing Bonmarche. They are reasonably priced, often do offers and have a good sale, and you can collect points as you buy.